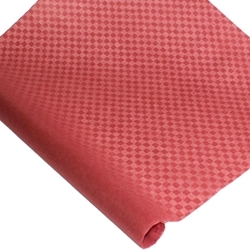 Soft and lacy, this Checkered Lace paper is a beautiful option for a variety of art projects. The thin, red sheet is perfect for overlaying on lampshades, books, and more. Available in 8.5" x 11". See more specifications and full product description below. This Japanese Lace Paper offers an exciting checkered pattern that alternates between thick and thin pulp concentrations while maintaining an overall high-level of transparency. Ideal for lampshades, multi-media artwork, notecards and more, the Checkered Lace Paper is available in 8.5" x 11" and 21" x 31"sizes.